Lean practice has evolved over the last 20 years, as one would expect. But has it evolved in a positive way? Has Lean practice, overall, improved with time? Today we see Lean accounting, Lean administration, Lean communication, Lean CFO, Lean distributors, Lean government, Lean healthcare, Lean HR, Lean IT, Lean leadership, Lean logistics, Lean office, Lean operations, Lean product development, Lean supply chain, Lean selling, Lean workforce, Lean higher ed, etc. What’s going on here? It is simply a reflection of the pervasiveness of batch-and-queue material and information processing, and thus the need to improve everything. Sounds good so far. However, a divergence seems to have developed between Lean of the 20th century (1950s through 1990s, call it 20L) and Lean of the 21st century Lean (2000s onward, call it 21L). 20L was the focused and rapid analysis of problems that impeded flow, followed by focused and rapid efforts (kaizen) to improve flow. In contrast, 21L is the diffuse and sluggish analysis of problems (any problem), followed by diffuse and sluggish efforts to correct problems. Improving flow is no longer the driving force behind improvement, and the cycle times for improvement have gone from short (hours and days) to very long (often weeks or months). The intervals between improvements have been substantially lengthened as well. 2oL did not discriminate in its application to a particular department such as accounting, HR, or purchasing, or to particular jobs held by workers, mid-managers, or C-level executives. Waste, unevenness, and unreasonableness existed in all departments and all processes. Lean principles and practices were seen as universally applicable. Lean tools, such as value stream maps, have become the central point of analysis in 21L, though in 20L value stream maps were nothing more than one of several ways to understanding the current state and identify pathways for improvement. We all know that the transition from conventional to Lean management cannot be mandated; it has to be led. But, keep in mind that the fastest way to lose the C-level audience is to make Lean complex. Suggesting to executives that Lean has attributes unique to its application in every different part of the organization invites the perception of complexity. 20L used shop floor kaizen as the principal means to learn how to identify and eliminate waste, unevenness, and unreasonableness, and improve flow. That learning was then diffused throughout the organization. Connection to this fundamental root has been diminished in 21L. The 20L that I experienced was fun and exciting, while people involved with 21L find it neither fun or exciting. Taking the fun out of Lean guarantees reduced participation, dramatically slower pace of improvement, and reduced learning. 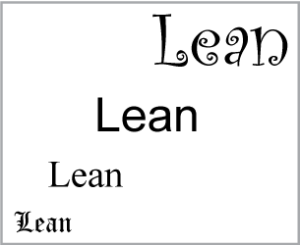 In organizations where this has happened, it is clear that Lean has evolved in a negative way. Instead of practicing kaizen (change for the better), they have inadvertently evolved into practicing kaiaku (change for the worse). The target condition for Lean practice should be 20L because it brings us closer to the outcomes that we truly seek: rapid improvement to achieve material and information flow. And it brings us closer to the people we want to be and the types of experiences we want to have. Toyota’s management system was long ago referred to by Taiichi Ohno as “shingijutsu,” meaning “new technology.” 21L is not that; it is turning shingijutsu into “babajutsu” – “old technology.” The whole idea behind Lean is to replace the old management technology with the new management technology. Instead, the old management technology is subsuming the new management technology. That was not supposed to happen. It’s interesting to note that Scientific Management followed a similar pattern of dispersion in the early twentieth century. After the principles of Scientific Management were defined by Frederick Taylor, Scientific This and Scientific That books appeared. (You can find them quite easily on eBay). The tools of Scientific Management were readily copied, but the essence of The Respect for People principle went largerly unnoticed or unappreciated as most stakeholders were maginalized from the effects of improvement. For 21L to progress, recognition and practice of the Repect for People (stakeholders) principle must occur, else the same fate awaits for Lean Management as Scientific Management.